Waffles are a Sunday morning fav around here. The boy eats them and I don’t mind whipping up a batch in the early hours. They are dead simple, fairly low on the sweet factor…until the syrup anyway. 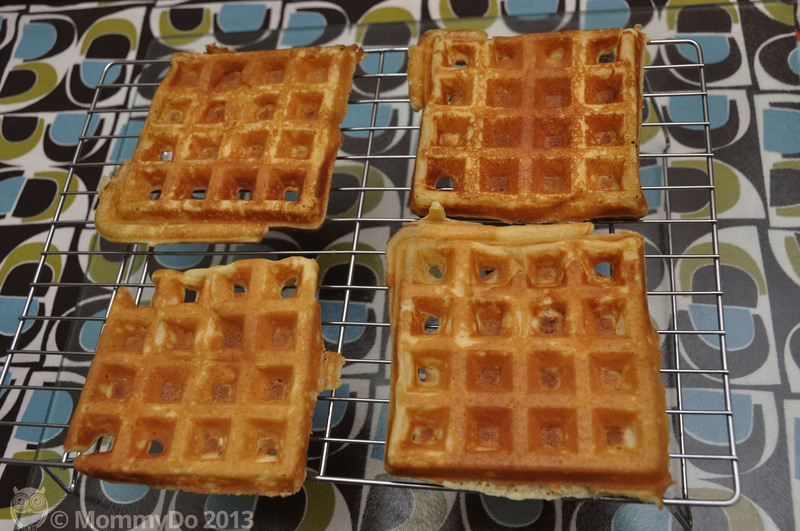 MOMMYDO WAFFLE TIP: Cool your waffles on a wire rack instead of in a stack to have a yummy crisp crust on both sides. Yes, these are a little ‘homey’ looking, but they taste fab. Super easy too. My favourite recipe is here, and takes about 5 min plus cooking time. I use a big whisk instead of the hand blender as I often make them with the boy while the husband is still sleeping. And, I usually add a whole teaspoon of vanilla rather than the 1/2 noted in the recipe. In case you’re thinking “wow, I could really use a waffle maker” I have a Cuisinart like this one and it works great. Waffles. Wire rack. You’re welcome. We have waffles most weekends, too. Love the wire rack trick, we will have to try it.